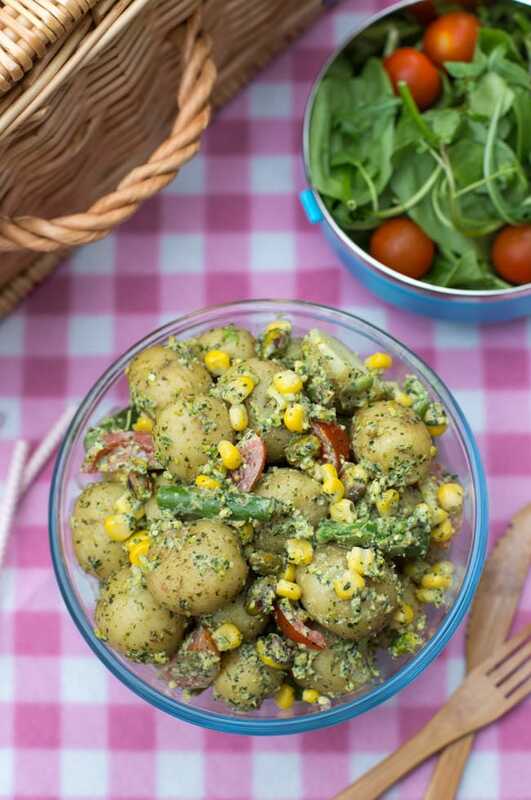 I apologise for the lack of recipes so far this month – this mint and pistachio pesto potato salad is the first recipe so far in June! Big slap on the wrist for me. I haven’t really been slacking (as you can tell from the fact that it’s Saturday morning and I’m sat here working in my pyjamas), I’ve just been really busy working on off-blog stuff, stuff that can’t go live until later in the month, stuff I’ve not been happy with, behind-the-scenes website stuff… It’s enough to make anyone need a holiday. 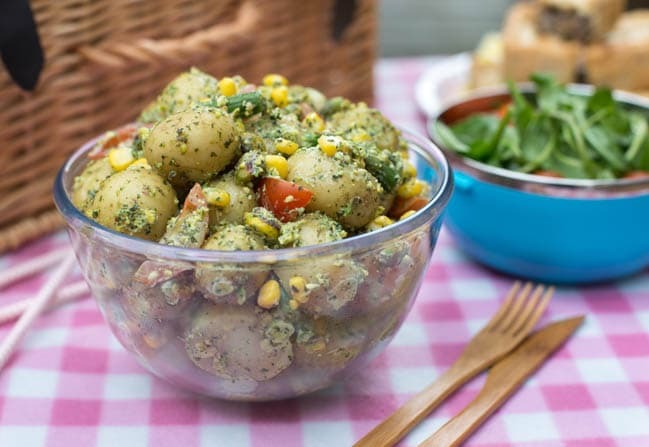 But that won’t be happening any time soon, so here, have pesto potato salad instead! The weather has been crazy here lately. Glorious sunshine (yay!) paired with unbearable humidity (boo!) followed by torrential storms (boo!) that clear the air and make everything feel fresh again (yay!). Rinse and repeat. I nearly got caught in a ridiculous downpour in London this week, but managed to get inside just as the first few raindrops were falling – and by the time I came out an hour later, it was sunny again. So bizarre. 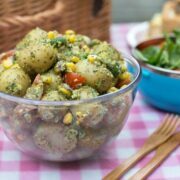 Assuming you manage to find a couple of hours of unbroken sunshine this summer, this pesto potato salad is perfect for BBQs and picnics. Rather than going for a heavy, mayonnaise-based dressing, I made an easy homemade pesto instead – believe it or not, there is such a thing as too much mayonnaise, and when you’ve got a few pieces of potato swimming in mayo, that’s probably it. A light and fresh pesto dressing is much nicer! I did add a dollop of Greek yogurt to make it a bit creamy, but you can easily skip this if you’d prefer a vegan potato salad. I made my pesto with mint, parsley and pistachios, which made it feel so summery. I’m always wary of using mint (I’m one of those people who thinks that 90% of the time, mint makes everything taste like toothpaste), but it works so well in this. It’s just enough to freshen everything up without making you feel like you’re on your way to bed. 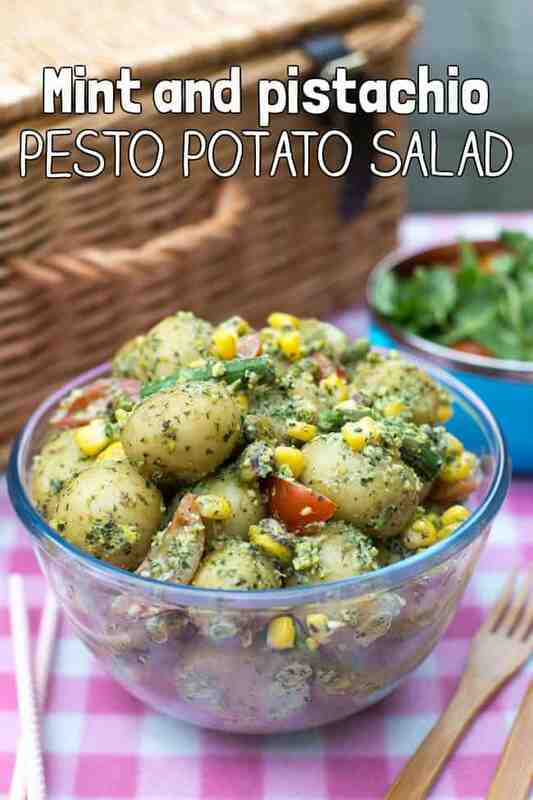 Don’t forget to add plenty of fresh veggies too, and your pesto potato salad is done! Easy peasy. If ay of your potatoes are larger than the others, cut them in half so that all of the potato pieces are approximately the same size. Boil the potatoes in a large pan of water for around 15 minutes, or until soft. Add the asparagus for the last 4 minutes or so of cooking. When both vegetables are tender (the asparagus should still have a slight crunch), drain, and set aside to cool completely. To make the mint and pistachio pesto, add the garlic, mint, parsley and pistachios to a mini food processor, along with a good pinch of salt and pepper. Blitz to form a coarse paste. If using, add the Greek yogurt, and blitz again to combine. When the potatoes have cooled completely, add them to a large bowl, along with the pistachio pesto, sweetcorn, cherry tomatoes, and some more whole pistachios. Mix well to combine, and serve slightly chilled. I’m in love! At least I am with the thought of this potato salad. I have yet to try it, but your mint and pistachio pesto sounds amaaaaaazing, so I don’t need much convincing. I made this two days ago and it’s yummy. I think I must have used much larger bunches of parsley and mint than you did, I used a whole supermarket packet of each, and should have added more yoghurt to loosen the texture of the pesto. In a rush to have it ready I also forgot the tomatoes, but it was still good. I put on extra yoghurt and the tomatoes when we had it last night. Yes that’s a bit more of each herb than I used, but I’m glad you still enjoyed it :) Thanks for reporting back! I usually pre-fer non mayo potato salads so this is right up my alley! That mint pesto sounds fantastic! Pesto is one of my favourite eats althou I have never made a mint and pesto version. You salad looks lush. I love the idea of pistachio pesto — move over mayo :) I think this will be my new favorite summer salad! Oooh, this will go down very well with my pistachio, pesto and potato loving lot, excellent addition to the potato salad repertoire, thank you! 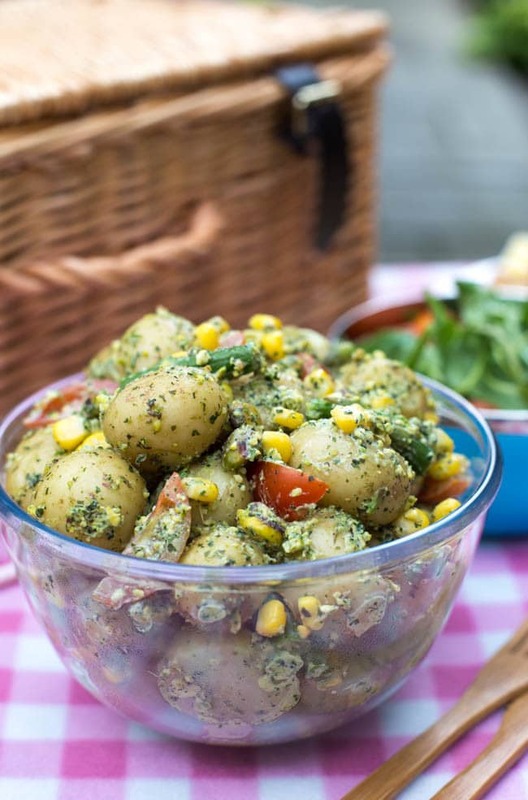 I’d love this potato salad rain or shine! Love the pesto (especially the pistachio part)! My husband doesn’t like potato salads with all that mayo on it, but I’m willing to bet he’d like this one! Can’t wait to try! Thanks Patricia, hope you enjoy! Oh wow, I need to try and make this. I love mint and I’m obsessed with pesto. I tend to use pesto in pasta so it will be nice to try it in another dish that is perfect for a summers day! I’ve been looking to extend my pesto repertoire recently (I made a gorgeous spinach one yesterday) so this will be going on my list, thanks! Ooh newborn babies make me go all funny – I really miss mine being like that. I’m eating so much fresh mint at the moment – Love the opportunity to pair it up with pistachio. I can eat anything with potatoes and pesto. Haha. This is perfect to bring for an event or dinner with the neighbors. This really takes a simple potato salad to the next level. 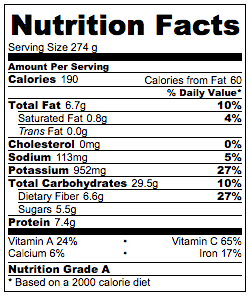 Love the addition of pistachios. This sounds like a dish a lot of my family would enjoy. Perfect to make for a bbq! I love mint flavours. I would love to taste this dish. Would have never thought to make this but I am going to give it a try now!! I’ve added pesto in before, I’ve never tried mint and pistachio! Looks like a good combination, amazing pictures btw. I think I’d love those flavors! I really like pistachios but I never really get to use them in my recipes. This looks like a great combination f flavours and I also like the fact that it is different from the norm in relation to potato salads. This looks like the best salad ever and I bet pistachios and mint really make a swell combination and brings out the flavours! I love potato salad and I love pesto! Win win! I adore potato salad, it is something I have to have, but have never tried one like this before, I definitely going to have to give it a go. The spicy yogurt cucumber salad sounds and looks absolutely amazing! I need to make it! Oooh yeah! Pass me the potato salad please! What a delicious twist on the traditional and I love that you have added pistachios to it. I’ve been using nuts more often lately, I never used to be a fan but they add such a great texture! Such a delicious summer salad :) I love pesto and I add to anything and everything (within reason!) I hope the weather improves soon so we can all go out for picnics! That looks absolutely delicious!! I never would have thought of a potato salad like that, but it looks like something that I definitely need to try! Just the other day Husband said to me that the potatoes are probably going to be ready for harvesting very soon. Apparently when they start flowering it’s a sign that there are Interesting Things going on in the soil. On a tangent, potato flowers don’t look even remotely like I want them to look. My brain keep wanting them to be bright yellow like courgette flowers, but in fact they’re pure white with a yellow centre looking not at all unlike a fried egg. Anyway! This made me start wondering what to do with the very first potatoes. I thought it should be something rather more fancy than just cooked in something else. I do believe you’ve just given me the answer. I can imagine this along side a marinated quorn fillet, perhaps. For the pistacios, do you use salted or unsalted? We hosted a brunchy/lunchy sort of thing today and I made this among other things. (You may recall I asked you about some suggestions) Way too many things. I’m turning into my granny, basically. “Is there enough food? I hope there’s enough food. No, it won’t be enough food! I must cook more food!! !” Soooo many leftovers. Brilliant idea to turn it into a pasta salad, I hadn’t thought of that! Hope you enjoyed it.